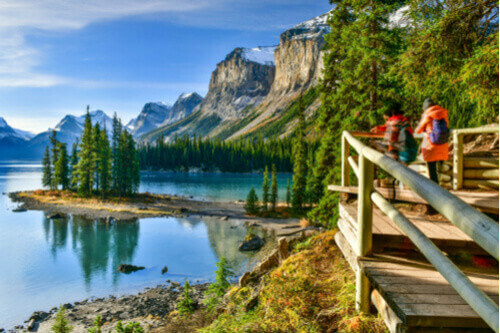 At the heart of Banff National Park, surrounded by snowy peaks and famous for its turquoise coloured-water, lies Lake Louise, the so-called Jewel of the Rockies. 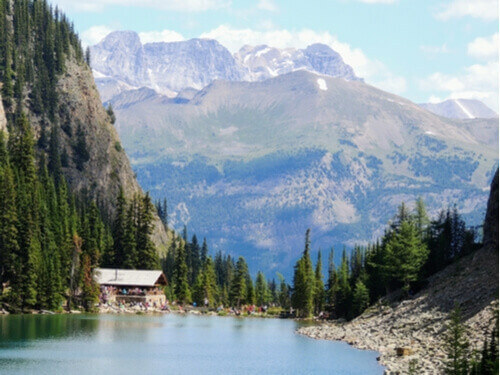 It’s a stunning location all year-round, with endless activities for all ages, but visiting in summer allows you to get out on the lake (which thaws between mid-June and October) for a paddle in one of Canada’s most mind-blowingly beautiful locations. 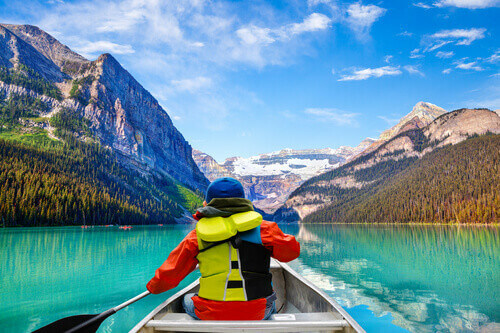 Rent a canoe from the Fairmont Chateau Hotel’s boathouse – first thing in the morning or early evening is best – and head towards the majestic Victoria Glacier for an experience that will stay with you forever. Whether you’re an experienced rafter or not, the Rockies are home to some of the wildest and most spectacular whitewater rafting in the world, and there are few better spots to hurl yourself downstream than Kicking Horse River in British Columbia. Named after a Scottish explorer who was kicked in the chest by his not-so-trusty steed in the 1850s, the route drops 350 metres over a 6km stretch of river in Yoho National Park with seemingly endless twists, turns and dips along the way. For some real solitude, set off from Lake Louise and follow the signs to the stunning Plain of Six Glaciers – arguably one of the most jaw-dropping hikes in the world. This steady, picturesque trek will take you through lush forest until you are high among the snow-capped mountains with views that are to die for. 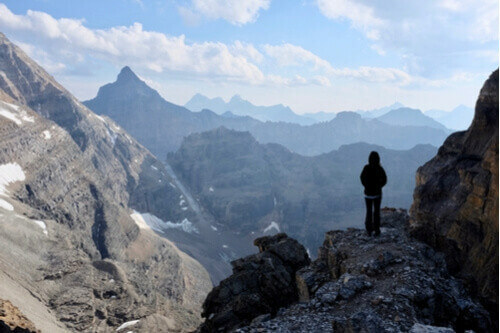 At 2,925m, Abbot Pass is high, so you’ll need to go prepared, but you’ll be rewarded with some of the best scenery in the world, not to mention tea and scones at the Plain of Six Glaciers Teahouse along the way. Don’t be put off by the name – a tour of Rat’s Nest Cave will be a highlight of any visit to the Rockies. Located east of the town of Banff in Alberta, the cave – the longest in Canada – is a protected landmark that is only accessible with a guide or special permission. The cave is home to a seemingly endless assortment of ancient formations, including stalagmites, stalactites and fossils. It’s also not for the faint-hearted; once you’re in the cave the only light will be generated by your headlamp and at several points along the way, you’ll have to climb, crawl and wriggle your way through some seriously tight spots. This is not your typical teashop, that’s for sure. For one thing, you’ll have to work for that brew – the trail from Lake Louise to Lake Agnes takes you up to 2,135m. But the views and the scenery along the way is worth it. Built in 1901 by the Canadian Pacific Railway, the Lake Agnes Teahouse has since been rebuilt, but it hasn’t lost any of its charm, iconic red door or period furniture. All supplies are hiked up to the teahouse by its staff and occasionally by horse and even helicopter. So doff your hat to them as you sit back and relax with your piping-hot tea and slice of cake in one of the most spectacularly located teashops in the world. Starbucks this ain’t. 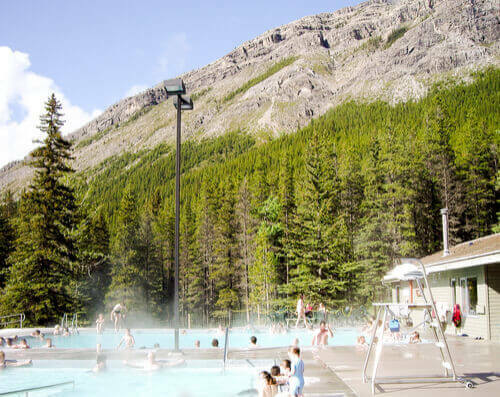 While there are more than a few hot springs to soak your weary muscles after a long day on the trail, Miette’s is often hailed as one of the finest in the Rockies. For one thing, its all-natural waters are the warmest (a relatively balmy 40C). For a ‘pleasurable’ shock to the system, plunge into one of the two cold pools nearby. Your body will thank you for it – the spring waters here are packed with natural minerals. Looking for a less strenuous way to access some of the Rockies’ most famous viewpoints? Look no further, the Banff Gondola has you covered. 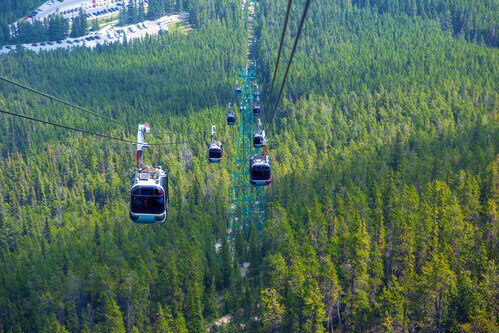 The ride to the top of the 2,281m Sulphur Mountain offers breathtaking views in every direction. Once you’re up there, take a walk along the ridgetop boardwalk to the newly rebuilt observation deck and meteorological station. And if all that beauty gives you an appetite, there’s even a top-class restaurant to welcome you. What trip to the Canadian wilderness would be complete without an encounter with a bear – from a safe distance, of course! 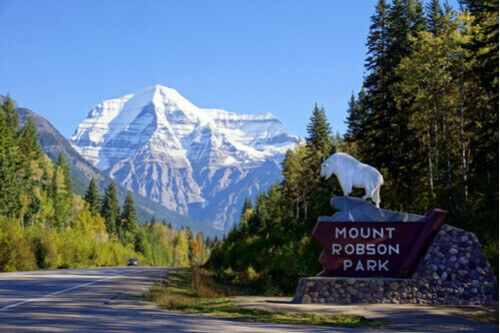 Mount Robson Provincial Park, also a UNESCO World Heritage Site, is a utopia for wildlife enthusiasts. The park is home to 42 species of mammals and 182 species of birds, including bears, elk, mountain goats and the iconic golden eagles. To catch a glimpse of the grizzly or black bear, your best bet is to go in mid-April as they wake from their annual hibernation and head to the south-facing slopes to fill their bellies. There’s really no better way to explore the trails of Banff National Park than by horseback. With tours from local ranches to suit all levels of experience, you can spend anywhere from a couple of hours to a few days living the cowboy life and riding high above the waters of Lake Louise and its surrounding backcountry. If horseback riding isn’t quite your style, you can even take in the views from a horse-drawn carriage instead. This tiny island in the middle of Maligne Lake is one of the most photographed spots in Canada, not just the Rockies. Once you see it for yourself, you’ll know why. The Stoney Nakoda First Nation believe the spirits of their ancestors are reflected in the surrounding mountains, thus the island’s moniker. To make the most of your visit to this difficult-to-get-to island, take a boat tour from Home Bay. If the setting wasn’t picturesque enough already, the closer you get to the island the more emerald the water becomes thanks to the nearby glaciers.